An Easy Water Filter Anyone Can Make - Begin Prepping Now!! Here is a low cost easy water filter that you can make anywhere. It can also filter up to 99% of e.coli and other nasties out of the water. This method of filtering can filter up to 4 liters of water per day. If your water needs exceeded that you could set up a couple filters to run simultaneously. 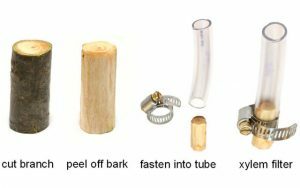 An MIT team experimented with a piece of sapwood, they used white pine, to create a water filter that could stop e. coli and other harmful pollutants clear down to a particulate size of 70 nanometers. The xylem layer which naturally moves fluid in a tree, filters water as it passes through. This filter is cheap, fast, easy and can be replaced every few days with no effort. I am super excited about this. I know this is something that anyone of any skill level can do. It is also a cool project to do with kids. It will show them that this prepping thing can be an adventure, not just a chore. Have fun with this. I have even seen people use food colored water to show how the filter works. It’s awesome! Wow, this looks like a fun and easy way to make a water filter. I never wood have thought , pun intended, that using a piece of sapwood from white pine would make a good water filter. I like the idea of using food coloring to see how the filter actually works. Knowing these easy ways to help us survive during times of desperation are good for emergencies. Just like all those people in Puerto Rico right now looking for ways to get clean filtered water. Something like this could help a lot of people, especially since it seems simple to do. Thank you for sharing this with us. I agree that this would be a great project to do with kids. It will help them to learn something important and something that has a hands-on approach. A much better use of their time than video games. Love the punnies! Puerto Rico is a very real example of why this kind of information is so important. If you are impacted by a disaster, this tip could help everyone in your neighborhood…but there is no way to get the info to them now with the power out and communication down. These kind of projects make a huge impact on kids. I know my kids remember these kind of things from scouting…and they were very small. Keep learning and hope to see you again! How interesting! I had no idea wood could be used to filter water. I like the confirmation of this from M.I.T. Your photo images clearly convey how to make the filter. I love the practicality of this info. Reminds me of Mother Earth News which I loved. Thank you! Thanks for the comments! Nature has amazing secrets to help us and keep us safe and well. I also loved Mother Earths articles. Love this post. This is amazing. How long should you cut the branch? How long would it take for the water to filter through the branch? It’s hard to believe that water would actually filter through – lol. Also would this method leave a “woody” taste with the water? Until now, I have never heard of this. Thanks for this informative post! I believe a 2-3″ piece of green sapwood would be sufficient. I does have a faint taste, but I hate the residual taste from iodine tabs and many filters also leave a faint taste of chemicals or charcoal. I prefer the woodsy taste and the cost and availability is a huge plus! What a very interesting and novel idea (at least it’s novel for me). I really like those kinds of DIY things. I’ll have to consider this for one of my upcoming projects. Filters cost so much these days and buying bottled water all the time can also be expensive over time. I would love to hear how it works for you. I love DIY. The bottled water is definitely a racket. Wow! I have never heard of this, does it really work? Does any kind of wood work? Do you have to remove the bark in a special manner? I mean, from a SHTF point of view, this is fantastic! I wonder what else you could use if there was no hose readily available. I always try to find simple tricks to survive if I had to. A real McGyver if you know what I mean. I wonder if you could use the bark as the hose????? something to try I guess. Thank you for this! I believe that a green branch is needed, because the membranes are still intact and moist. You can just peel with a pocket knife. If you used a thin barked shrub, you might be able to use a potato peeler. I think the best thing would be to experiment with trees that are local to your area. I would check with an extension agent to make sure the tree you are using is not poisonous. Some ornamental shrubs are. You could use a funnel, or make a tube of paper. It would do in a pinch.I am hoping to do some experimenting of my own. I just found this and had to share. I haven’t gotten to play with it yet. This is brilliant! While I will not need it – we have a water filter installed, which is awesome, I know some people would benefit from this info. I had no idea it was even possible to make your own water filter. Love it. Blessings! This isn’t really necessary for a home, however I’ll bet it would be a cheap easy way to get the chlorine taste out of city tap water. The best application for this would be an evacuation, where available water may be questionable. It would also be useful in a situation like what happened in Flint, MI where pipes got contaminated. It also works if the power is out, which is an advantage over home systems which require power. That’s amazing! I have never heard of using wood to filter water although there was a scene in the Hunger Games where they used a device to extract water from a tree. Must do some further reading on this as it sounds interesting. There are some trees that have a very high water content, you can actually drink the sap. This is a different thing deal, but the same cell structure that moves water from root to top in a tree, is what filters the water and moves it through. I think this is so cool! If you have all of the pieces, it will take less than five minutes to put together and implement. The most time consuming part, will be locating a green branch and peeling it. With that out of the way, it will probably take less than two! Have an awesome week!